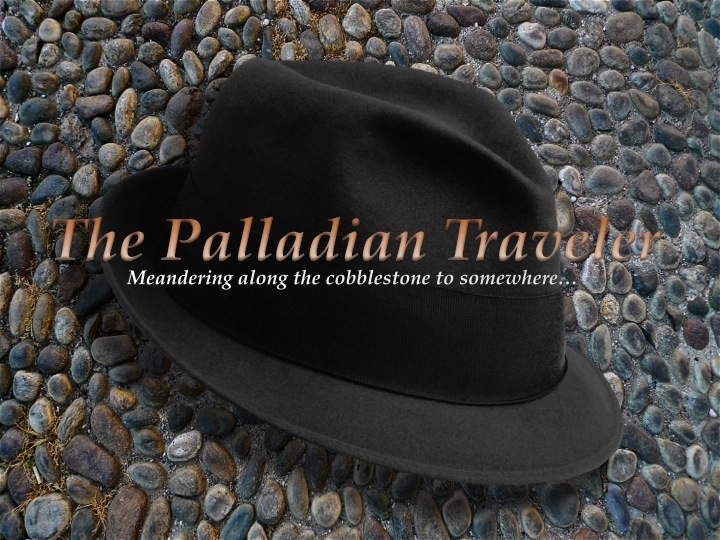 Who is The Palladian Traveler? Our HQ WordPress belle, Michelle, recently went over the state line to seek change in her life, and would like all of us to follow suit. She’s asking us to capture in a frame or two a major change that has, is or will be taking place in our respective proverbial backyards. And, that’s why this week’s WP Weekly Photo Challenge is CHANGE. In my neck of the Italian woods, it’s mandatory for all cars and trucks motoring around during wintertime to either be outfitted with snow tires or have a set of tire chains at the ready in the trunk. 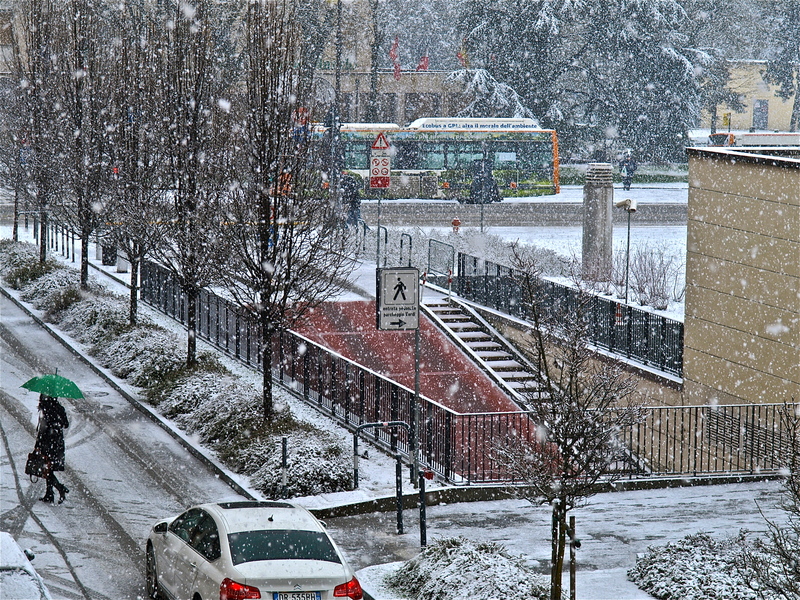 This cold weather road code remains in effect during the entire hazardous driving season all across northern Italy, beginning November 15th and ending tomorrow, April 15th, or for half a year. So, sometime this coming week, I’ll drive over to the nearby dealership and finally slip out of my winter “footwear” and into my summer treads, a set of 225/45 R17s hibernating inside a climate controlled storage room — kinda like a cantina for tires. The same goes for my real feet as well. With weeks of endless rain and cold temps finally in my rearview mirror (fingers crossed), I can now CHANGE out of my bulkier, heavier footwear and into sportier, lighter and more fashionable scarpe (shoes). 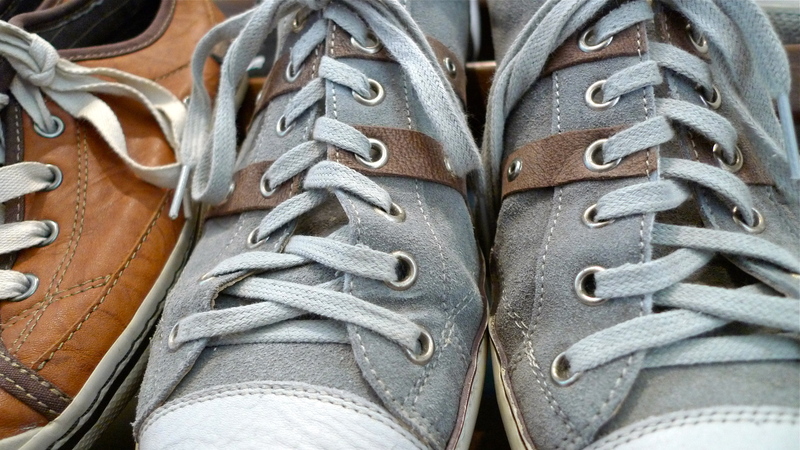 Like eyeglasses and blue shirts, I do love shoes and have plenty of pairs from which to choose and CHANGE. That said, with spring now here I may find it difficult to pass by, and not go into, the many shoe shops that dot Vicenza’s main shopping street, the stylish Corso Palladio, and pick up a few more boxes to add to my collection. With my 9-to-5 life well behind me, and the associated business attire that went with it, I’m now totally casual, and my footwear would agree. I love sneakers, my fave footwear, and sport them all the time with jeans — in a variety of colors — just like my pedigree Italian friends. 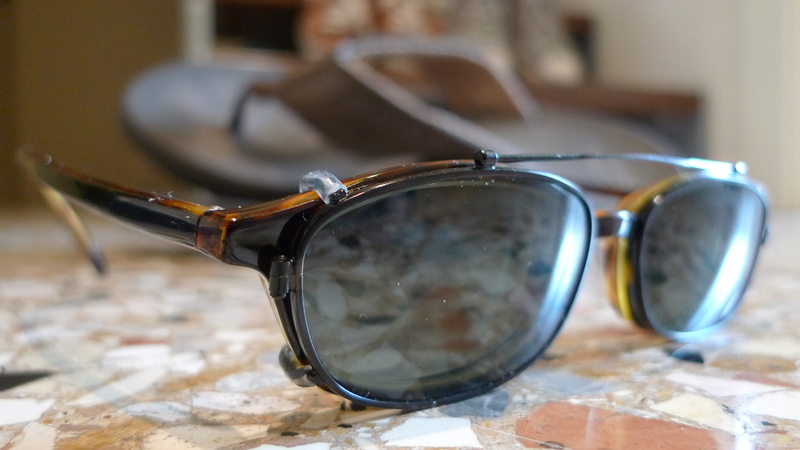 But, when the dog days of summer arrive, all those sneakers and long pants go back into their boxes or high up in the closet, yielding the runway limelight to the new kids on the block: flip-flops and cargo shorts. Yep, CHANGE is afoot — in the air, on my car and around my toes. Tom traded his hometown St. Louis Cardinals' baseball cap in the United States for a Borsalino and he now hangs his "capello" in the Puglia region of southeastern Italy. A veteran print and broadcast journalist, with well-worn passports that have got him into and out of 50 countries and counting, Tom fell in love with the "Bel Paese" years ago. As he notes, "I'm inspired by the beauty I find in all things that are very, very old, and reliving history, or at least meandering along cobblestone streets that were laid down over a thousand years ago and just looking up and marveling at what occupies the space still today, really gets my 'Vespa' running." Tom has a good eye behind the lens and is a graphic storyteller, but he'll let you decide as he keeps his camera batteries fully charged and the posts flowing from his creative hideaway in the hills overlooking Ostuni. You can also follow his dispatches along the cobblestone via TravelingBoy.com. Meredith — Italian shoe stores — Cathedrals of style, indeed! Love your interpretation of change. 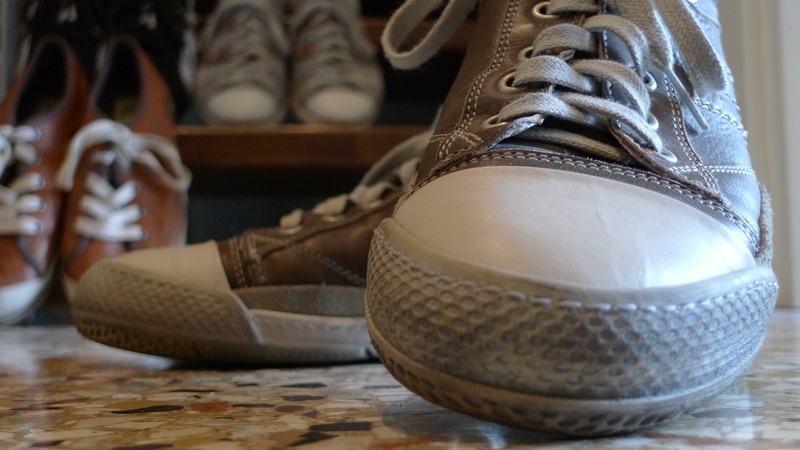 You almost convinced me that it would be fun to love shoes – but alas I am not a shoe lover. I have three pair that I wear most of the time and two of them are the same. Basically I have summer sandals (two identical pairs) and loafers. Oh, I do have a pair of dressier shoes to wear when we socialize during winter when I’m in Michigan. More exciting than changing into sandals is that my toes show – and that means putting on my hot pink toe nails. Now that makes life fun! Pat — Pink toenails. You’ll have to blog about that when you get back home. Thanks! This is a great take on this challenge Tom. After being raised in Florida with one wardrobe, it was a challenge to get used to the idea of winter wear and summer wear. Double clothing. I like the info you gave about the winter tire protection. Good to know they want people to be safe. Very nice interpretation of change. Always Tom, feet must look good, otherwise the head will hurt. I am very spoiled in that sense. Well done 🙂 great post for the challenge. You’re talking my language – shoes! Nice post. Steph said I wasnt allowed to wear flip flops in Italy – please have a talk with her. You’re coming to France, where flip-flops are welcome. I’m sure Mauri will be packing. Enter your email address to follow The Palladian Traveler and automatically receive notifications of new posts by email. Grazie mille!